From the In Case You Missed It files, a quick lesson. 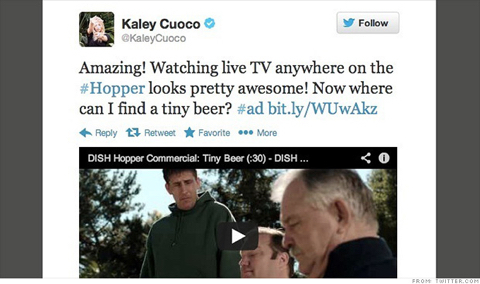 Kaley Cuoco – aka Penny on CBS’s “The Big Bang Theory” – recently sent out a paid endorsement tweet, as celebrities and famous internet people are apt to do, endorsing DISH’s Hopper DVR. As you can see, the tweet was marked with #ad, so that isn’t the issue. The problem is Cuoco’s employer, CBS, is currently in litigation with DISH over the Hopper DVR. Oops. It looks like Cuoco is going against her employer, praising the Hopper while her network is locked in a contentious lawsuit over the Hopper. The tweet is now gone, and no one in Cuoco’s camp is saying anything more about it. As an objective, third-party observer, all this appears to be just a misunderstanding. There seems to be no malice toward CBS, Cuoco doesn’t appear to be slamming her network in praising DISH and their Hopper DVR. More than likely, she sent out the tweet (compensated by DISH for doing so), someone (probably at CBS HQ) whispered in her ear ‘hey, you know we are suing them, right?’ and she took down the tweet. No harm, no foul. Lesson learned. Let’s move on. Leave it to the parties in the lawsuit to blow things a bit out of proportion and get their digs in on the other side. Lost in the catty rhetoric of opposing parties in a lawsuit is a valuable lesson. There have been countless tales of Twitter woe, tweeting something to everyone you intended to be private (see Anthony Weiner), posting something in questionable taste or in error (American Apparel & Gap, KitchenAid), or not taking into account the larger picture (Entenmann's). Cuoco, if anything, would be guilty of the third – not taking into account the larger picture of her employer being in a legal battle with the product for which she voiced her (paid) support. In all fairness to Cuoco, keeping abreast of all the legal comings and goings of her employer is really outside her scope of interest. And it is clear the ad tweet itself was well-crafted and a good use of the medium to get the message across. Kudos to DISH for leveraging Twitter and the celebrity of Kaley Cuoco effectively. This kind of situation is something that is going to come up with greater frequency as more and more employees and companies enter the social media space to interact and conduct business. Before you click to post your musings or your crafted marketing message, take a :60 time out. Read over what you have written. Is it concise, accurate message? Have someone else read it, preferably someone not in your department/team. Does it mean what you intend it to mean? Do hashtags relate to the subject, or have they been used by another entity, with an entirely different meaning? Could your tweet be interpreted another way?